We are pleased to announce that as Manitoba's premiere Hustler dealer, the new Raptor Flip-Up model is now available for purchase. The Hustler Raptor Flip-Up features a Patent Pending push button deck lift for easy cleaning and maintenance. In only 22 seconds, and without removing the deck belt, the deck raises to a 90 degree angle. This technology is a first in the industry and was received with high praise and excitement when introduced to dealers in September at Hustler Days in Orlando. 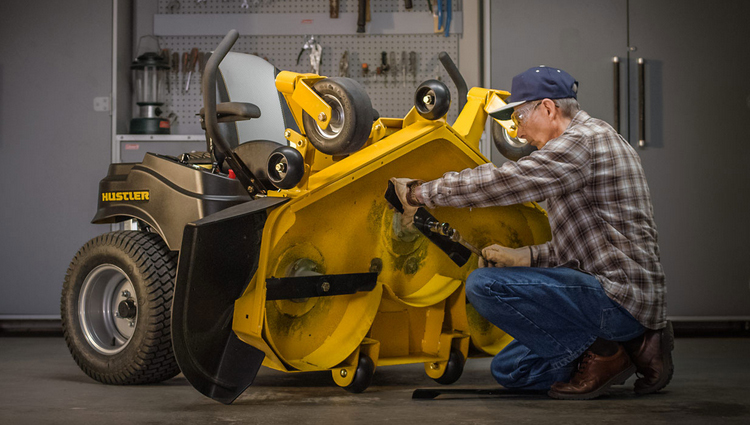 The Flip-Up’s other features include a new 25hp (725cc) Kohler engine, heavy-duty fabricated steel deck, and Hustler’s patented automatic brake system, and push button deck height adjustment, and a three year/300 hour limited warranty. Earlier this year, the Hustler Raptor Flip-Up was named one of Landscape and Irrigation's TWENTY for 2015 New Product Award Winners. For more information on the Hustler Flip-Up, or the complete zero-turn product line, call us at (204) 222-5222 and schedule a viewing.